"23 Jesus answered and said to him, "If anyone loves Me, he will keep My word; and My Father will love him, and We will come to him and make Our abode with him. 24 "He who does not love Me does not keep My words; and the word which you hear is not Mine, but the Father's who sent Me. 25 "These things I have spoken to you while abiding with you. 26 "But the Helper, the Holy Spirit, whom the Father will send in My name, He will teach you all things, and bring to your remembrance all that I said to you. 27 "Peace I leave with you; My peace I give to you; not as the world gives do I give to you Do not let your heart be troubled, nor let it be fearful. 28 "You heard that I said to you, 'I go away, and I will come to you ' If you loved Me, you would have rejoiced because I go to the Father, for the Father is greater than I. 29 "Now I have told you before it happens, so that when it happens, you may believe." The faithful is in the Scripture i.a. described as children - children of God - and we understand of the Scripture elsewhere that they do not hold this description solely because they are born of God, even though that is the main cause, but also because they in spiritual things precisely is like children. Just read the history about Jesus‘ disciples and you will see that (and I guess you have your own experiences too?). We are also seeing it on the gentile congregations afterwards - e.g. the Corintian - and the Galatian congregation and the great difficulties Paul had with them (see also the letters to the congregations in Revelations in this coherence). - Like children they fell from the Gospel which was preached unto them - yes, portrayed to them (Gal. 3:1), and let themselves coax by different spiritual movements which promised them "greater things" etc. Another description of the faithful is, sheep. And sheep are animals, which above others have to be led. These people can certainly be professors in various subjects and sciences, but when it comes to spiritual things, we are, so to speak, tangible limited. This has its reason in the fall of man, says the Scripture. It is the fall of man’s consequence, this unfamiliar feeling towards the spiritual world - unto God. The Word of God speaks that we must grow in grace and knowledge to the One/Him. (2 Pet. 3:18). The spiritual world represents therefore also a danger for us people, if we seek it in a wrong way and/or by wrong channels. You can meet people who seem so highly Bible loyal and trustful in their relationship to God: "I believe that when I have delivered myself unto God, are praying to Him about guidance and light, and willingly want to belong to Him, then He will not let me go astray, but enlighten me by his Spirit" - all while they do not want to lend ear to the warnings and admonitions the Word of God, which after all exactly is the Spirits word, is bringing. One is leaving, or won't listen to the Word when it becomes unpleasantly searching, or does not harmonize with their desire, and therefore seeks the Spirits guidance by mysterious ways instead. You can see a lot of this, today. It is accordingly necessary with a growth - and in this growing season we are standing in especially great danger to be prostrated (like the straw which yet hasn‘t got strength to stand against the strong wind), and be led astray, away from the foundation. Jesus speaks about acknowledging the truth - that also means, and not least, the truth about us, and then also this truth about our spiritual wretchedness. It works accordingly like that, that you get anxious to go on your own, like a person in the darkness you are praying for light, you learn to listen for the shepherds voice (the message), you have to know that it is Jesus‘ word before you dare to take the decisive step. How is it with the person who does not have acknowledged this truth? Certainly, he does not fear to go astray, and therefore he flutters like a butterfly from one flower to another, the one windy thing that is taught after another, and ends up with a mixture of all sorts of things. Something that is especially notable today. All acknowledge of oneself as child, is gone, one has been grown-up in own eyes, in spite of the fact that one in reality is child, and thereby opinionated and assertive in lieu of listening and praying. This is a dangerous condition, which the devil is leading the "reckless" into. Because whoever does not want to listen to guidance with a humble mind, he can neither God nor people help. But all this has accordingly its cause in the fact that one did not acknowledge the truth about oneself! But since the truth now is this: We are children - yes, sheep - Jesus promises us something. He promises us one who shall take care of us. (v.26). We shall accordingly be let off to puzzle out these things on our own - we shall be permitted to lay it over on Him. He is the one who has assumed Himself this case, to lead us saved through. When a shepherd has guided the flock of sheep home, it is him who is liable for those, which possibly have been lost on the way. But it was someone that did not know the shepherds voice - and thereby revealed that they (he) was not His sheep - and went after other voices. (John 10:4-5). The good shepherd He calls Himself. Note! what the task of this spokesman is: "He will teach you all things, and bring to your remembrance all that I said to you." (v.26). He shall not teach something new, He shall amplify, remind of and explain what Jesus has preached. Jesus is pointing at this thing in the text here too, that our relationship to His Word, reveals our true relationship to Himself. That we love Jesus is not shown first and foremost in some enthusiastic feelings, which after all, in highest degree, can be produced superficially, but in the fact that we keep His Word. (v.23). Which in this connexion means - not to fulfil anything by one or more doings, but to take care of the message and stay in it, as Jesus says elsewhere: "Stay in Me!" And: "Stay in My word!" In ancient time - also in Israel - people dug valuables down in the ground on one particular place out in the nature. Those things one feared to lose and therefore wanted to preserve. It is in this meaning we shall understand Jesus’ word here. This is to keep His word, or to do the word, as it is also called. Not to hide so that others cannot find it, but pure and simple to fear losing it. And hear what Jesus says about this word in the next chapter: "You are already clean because of the word which I have spoken to you." (John 15:3). I guess that should be worth hedging! It is by this Word you stand clean before God. And mind you what Peter later on witnesses: "And there is salvation in no one else; for there is no other name under heaven that has been given among men by which we must be saved." (Acts 4:12). It is not only this, that it is by this word/message we are saved, but it does not exist anything else either! If you lose this you lose everything. Without this Word in your heart, you are standing without the citizenship of Heaven, without a correct understanding of the Father and the Son and the Holy Spirit, without a correct understanding of God and His salvation, in other words you are lost. Therefore i.a. Peter got this message: "Go”… “stand in the temple, and keep on telling the people everything about this life!” (Acts 5:20). Note! the expression: This life. Accordingly, in this Word is the life! We know it is the word about Jesus, the word about the cross, the word about the blood of The Lamb, in other words, the Gospel itself. And then says Jesus, that this, and not all kinds of mighty doings and "manifestations," separates the true believers from the false, they who love Jesus, and they that do not love Him: "If anyone loves Me, he will keep My word." (v.23). Perhaps you ask: Do I love Jesus? I often feel both so cold and empty and indifferent. Certainly, that is not good, but can you manage without the word about the cross? Is it the word about Jesus sacrifice and vicarious act that always warms you up again? 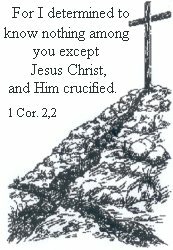 Is it important to you to know that Jesus anyhow loves you - something that has been revealed unto you exactly by this, that He takes your place on the cross? If so, you are one of those who keep His word. "No, for all the thing I knew, I can not lose my Jesus" (From the Norw. songbook). And so you get, and you have, this mighty promise: "...and My Father will love him, and We will come to him and make Our abode with him. (v.23). In the believer - whoever accordingly keeps His word, is according to the text here - the triune God Himself on hand. Father, Son and Holy Spirit, has accordingly come to live in your heart. And you, you are often so downhearted as if you were handed over to yourself! The person, who lives in this humble comprehension of himself and his insufficiency, cannot go astray, because they have according to the promise the Spirits light, and thereby the Words guidance. But the others, they who haven't bent down for the word, when it spokes to them about their sin and failure, and therefore haven't come to acknowledge the truth, they do not, and cannot, appreciate this word. - They are leaving it with the supreme easiness and turn to this and that which seems more exciting to them, and thereby they reveal that they do not love Him, even though they certainly can be situated in a spiritual state in which they shout and witness more about Him than any others, with the mouth, but the heart is only taken up with His gifts and all the benefits one can get out of living with Him. "And the word which you hear is not Mine, but the Father's who sent Me." (v.24b). "The Father who sent Me, He has testified of Me," says Jesus (John 5:37), therefore, beware of what you are doing with His testimony. "Peace I leave with you; My peace I give to you; not as the world gives do I give to you Do not let your heart be troubled, nor let it be fearful!" (v.27). This is Jesus‘ gift to you - the heavenly peace, His own peace, which is more than a feeling, so you shall not fear. All this is in the word He speaks unto us to keep.